The famous Mediterranean beachfront in Nice in southern France is known as the the "Promenade des Anglais" ("Promenade of the English"), or often simply "La Promenade" or "La Prom". During the 18th century (at a time when Nice was part of the Duchy of Savoy), many English visitors began spending the Winter in the city. At that time, buildings were set back from the sea on higher ground, and beach was deserted. When, in particularly hard Winter, many beggars and drifters came to Nice, some rich English visitors suggested that they construct a walkway ("chemin de promenade") along the seafront. 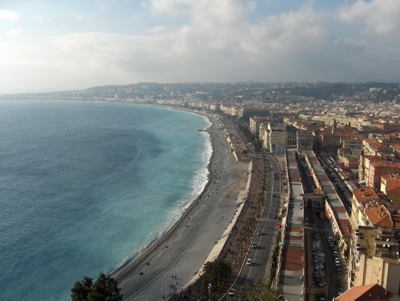 The city of Nice, however expanded the scope of the project, and eventually organized construction of pleasant promenade. This was known, in the Nissart dialect of the Occitan language, as "Camin deis Anglés" (the "English Way"). After France annexed Nice (and the entire Duchy of Savoy) in 1860, the promenade's name was converted to French, and it became known by its present name, the "Promenade des Anglais". Among the best-known features on the Promenade des Anglais, is the Hotel Negresco. This is a world-famous palatial hotel that faces directly towards the seafront. The Hotel is famous for its building, the luxury accommodation for guests, its gourmet restaurant ("Le Chantecler"), and the unusual uniforms worn by its staff, especially its doormen. In 2003, the Hotel Negresco was designated by the French government as a national historic building.